A wallpaper based on Duo Maxwell, otherwise known as Gundam Pilot 02 and the God of Death (Shinigami). 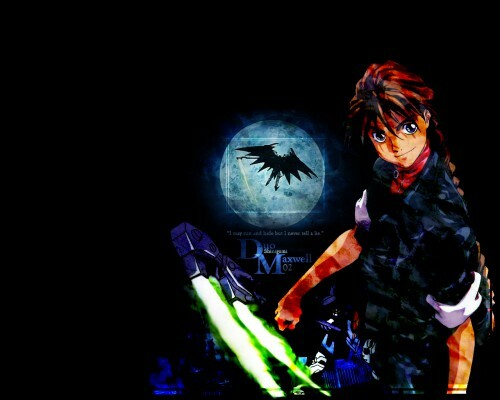 The wallpaper was created by using a number of images from the Gundam Wing series: a large image of Duo Maxwell himself, a picture of the Deathscythe Gundam warning off an enemy with its scythe and an image of the Deathscythe in the middle of the moon about to drive to the ground and attack its enemy from above (taken from Endless Waltz, the Gundam Wing movie). The images were then minipulated by using Photoshop. The layers effects were tested and changed (from 'Normal' to 'Colour Dodge', 'Hue', 'Hard Light', etc) so that the images would blend together once a couple of texture layers had been added to add to visual of the wallpaper. Text was then added as well as a border but that can only be seen at the bottom of the wallpaper clearly because of the layer effects that have been used on it. Browse Duo Maxwell Gallery: Recent | Popular. I really apprecciate this! thanks a lot ^^ pretty wall!